Dette er en revideret og opdateret genudgivelse (ændringer foretaget 2018) af en artikel af Hubert Kowalski: “The Legacy of Thorvaldsen in 19th-Century Warsaw”, in: Annales, Centre Scientifique de l’Académie Polonaise des Sciences à Paris, 16, 2014, pp. 163-172. Teksten er ikke oversat og vises derfor på engelsk både i den danske og den engelske visning af Arkivet. Se den oprindelige artikel her. Long awaited in this capital, the renowned artist Chevalier Thorvaldsen arrived here on the 19th of this month, with the intention, as we have already reported, of concluding the negotiations regarding the monument to be erected in honour of the Hero whose memory we cherish, His Grace the Prince Józef Poniatowski. Bertel Thorvaldsen arrived in Warsaw, then the capital of the Kingdom of Poland, on 19th September 1820, a Tuesday. The 30 days he spent in the city were extremely productive. The artist applied for, and received, an audience with Tsar Alexander, during which he obtained permission to create his portrait. He signed a contract for the model of the monument of Prince Józef Poniatowski. He also settled an agreement to create a monument of Włodzimierz Potocki. All this allows us to suppose that Thorvaldsen was leaving Warsaw in an extremely good mood. He left the city satisfyingly richer than he had arrived, not only when it comes to new experiences and acquaintances, but also financially: contracts he had signed guaranteed an immediate payment of his considerable fees. Yet even though his sojourn in Warsaw was predominantly a business one, Thorvaldsen was not the only side to benefit from it. Investing large sums into cultural concerns, Warsaw gained far more than the contemporary patrons and benefactors of art may have foreseen. The legacy left by Thorvaldsen after this 30-day sojourn is invaluable. His art slowly but inexorably transformed the 19th-century Warsaw. The beginning of this transformation took place at one of the receptions organised in Warsaw to celebrate the visit. On the occasion of this renowned Artist’s visit and wishing to assure him of their respect, the Department of Fine Arts together with other Professors of the Royal University of Warsaw gave a banquet in his honour, noted the Warsaw Gazette. The banquet was given two days after Thorvaldsen’s arrival. Since its organisers were Warsaw academics, including professors of the Department of Fine Arts, it certainly provided an occasion for the honoured guest to establish many useful contacts. To us, the most important incident of this ceremonial gathering was Thorvaldsen’s first encounter with Paweł Maliński. Their acquaintance soon resulted in Maliński’s obtaining a scholarship to Rome, where he worked for two years under Thorvaldsen’s tuition. Other Poles working in his studio together with Maliński were Jakub Tatarkiewicz, Karol Ceptowski and Konstanty Hegel. This group of artists, Thorvaldsen’s pupils all, paved the way not only for the development of art, but also for the development of artistic life – and not only in Warsaw itself. Before the original sculptures of the Danish master arrived to Warsaw, dozens of buildings had already been decorated by sculptors who achieved their style under his supervision. As the Polish art historian Artur Badach has written, “Among everything that was built in Warsaw some hundred and fifty years ago, it would be difficult to find a piece of architectural decoration, for instance, whose making had not been influenced by one of those artists”. The following catalogue of pieces by Paweł Maliński, by no means a complete one, with their location on the map of Warsaw gives an idea of the number of works and the area covered by the activity of just this one pupil of Thorvaldsen. It is worth adding that Paweł Maliński held the post of the Professor of Sculpture at the University of Warsaw until it was closed as part of the repressions after the November Uprising. 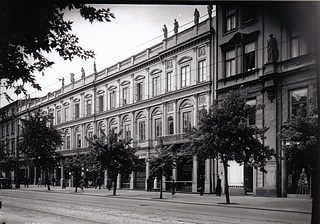 Konstanty Hegel, in turn, for over twenty years held the post of the Professor of Sculpture and Drawing at the Warsaw School of Fine Arts, starting from 1844. The third of our outstanding sculptors, Jakub Tatarkiewicz, was the author of several valuable publications on the methodology of art teaching, including the two most important: Theoretical and Practical Teaching of Sculpture [Nauka sztuki rzeźbiarskiej teoretyczno praktyczna] and The Sculpture Handbook [Przewodnik sztuki rzeźbiarskiej]. Tatarkiewicz also sculpted in marble the beautiful bust of Maria Szymanowska, after Thorvaldsen’s model. The idea to buy a set of plaster casts of Thorvaldsen’s works for the University’s growing collection of sculptures was conceived by the illustrious assembly of academics, most probably at the same banquet. The idea was supported by Minister Stanisław Grabowski, who later negotiated their purchase with the sculptor; the collection was intended for the University’s Department of Fine Arts to serve as educational aid. The idea was never fully carried out; the University collection held only a few plaster casts of Thorvaldsen’s works. The inventories mention the following: “B. Thorvaldsen: Copernicus, above life size, seated (Fig. 1); B. Thorvaldsen: Day (Dawn, flying figure); B. Thorvaldsen: Emperor Octavianus Augustus, marble, copy by Konstanty Hegel; B. Thorvaldsen, An Albanian Woman, bust of a young woman, marble, copy by Konstanty Hegel; Thorvaldsen, Monument of Prince Józef Poniatowski, 1827, head in profile” (Fig. 2). Models of the monument of Poniatowski arrived from Rome in 1828, together with three “chests of marbles by Tatarkiewicz, the stipendiary.” The already-mentioned Copernicus was “A work by Thorwaldsen, model for the statue of Copernicus”, a gift to the University from the Association of the Friends of Sciences. At the presentation ceremony on 22nd June 1830 Julian Ursyn Niemcewicz said: “Having it in its collection, the University will be certainly vigilant to keep this work by so excellent a Master, and a tribute our renowned Astronomer, inviolate. It is to be hoped that, having this model to admire, some second Thorvaldsen or Canova shall one day arise in our land”. These are not all the copies of Thorvaldsen’s works that used to be in the collection of plaster casts. Inventories from the mid19th century are lost; the full catalogue of those works is impossible to ascertain. We know, however, that the University had at least one more plaster copy of a sculpture by the Danish master. 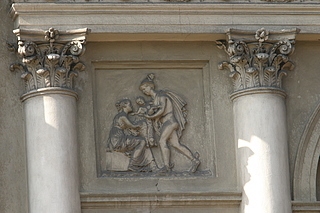 In addition, as a copy carved in stone, it came to decorate one of the Warsaw buildings. 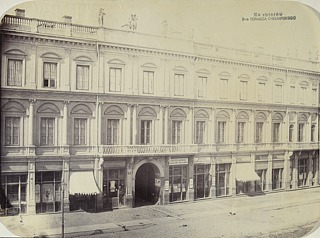 In the middle of the 19th century Józef Grodzicki commissioned Henryk Marconi to design a tenement that was perhaps one of the most splendid of those situated along the Royal Road (Fig. 3). This two-story building had an exceptionally varied sculptural decoration of the façade. In addition to the frieze of floral garlands, relief tondos and panneaux with mythological motifs, and the winged genies in the arch of the gate, which are all still extant, the attics of the three false projections were decorated with fourteen sculptures. Produced by the students of the School of Fine Arts, they were modelled on the plaster casts in the University’s collection. Those figures, as well as the rest of the sculptural decoration of the façade, are the quintessence of how the University’s collection of casts influenced the Warsaw milieu. Incidentally, the collection was situated right across the street from that tenement, immediately behind the university gate. It is worth adding that the students worked under the supervision of Konstanty Hegel. For the decoration of the tenement, Hegel selected the group of Eros and Psyche at Mount Olympus to be placed on the balustrade. It was a copy of Bertel Thorvaldsen’s work from about 1807, showing Eros attentively watching Psyche, who is about to drink the elixir of immortality (Fig. 4, 5). The following two are Mercury, Bacchus and Ino (Fig. 7), and a group of figures from the Alexandrian frieze. The three first were made by Thorvaldsen in 1808–1810 for the Christiansborg Palace in Copenhagen. 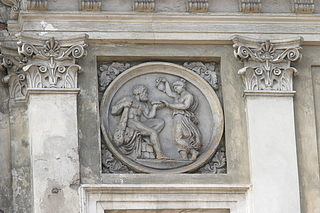 His Alexandrian frieze, in turn, was placed in one of the chambers of the Quirinal Palace in 1812. Drawings of the frieze are found in Rafał Hadziewicz’s sketchbook from the years 1829–1831. This sketchbook, still extant and currently in the National Museum in Warsaw, is a catalogue of historical monuments that Hadziewicz had seen in Rome. It must be added here that Hadziewicz was a student at the Department of Fine Arts of the University of Warsaw in the years 1822–1829, and from 1846 was a Professor of Painting at the School of Fine Arts. By one of the sketches Hadziewicz made a note: “I drew this after my dear Thorvaldsen, so well known to me, in his own studio at Piazza Barberini in 1831”. To conclude with what we have begun: the two prestigious commissions Thorvaldsen accepted in Warsaw. These are, of course, the monuments of Prince Józef Poniatowski and Nicolaus Copernicus, which to this day adorn the Krakowskie Przedmieście street in Warsaw. Thorvaldsen agreed to create the sculptural monument of the Polish national hero in May 1817; its plaster model is visible in a contemporary painting showing the sculptor’s studio in Rome. The work on the monument began in 1818, after the contract had been signed in July. The document allowed the sculptor a year to produce a plaster model of the equestrian statue. The works were slowed down by the debate regarding the final shape of the monument. The plaster cast, transported in parts, and moulds for the bronze cast reached Warsaw only in June 1828. The model was shown to the public in a temporary building by the National Theatre. The bronze cast was made in 1832. Due to the tense political situation and new decisions as to the location of the monument, the sculpture was sent to the Modlin fortress. Tsar Nikolai I, a heartless despot, decreed that the monument be destroyed. Governor Ivan Paskevich intervened and the sculpture was transported to his estate in Homel. Only in 1922 did this excellent statue return to Warsaw. Unveiled at Plac Saski, it was unfortunately destroyed by the German army in 1944. After the war, a new cast was made on the basis of the plaster model held in the Thorvaldsen Museum, and came to Poland as a gift from the state of Denmark. It was initially placed in front of the Orangery in the Łazienki Park, but in 1964 it was moved to the place originally decreed for it by Tsar Nikolai I. Today it stands in front of the former Governor’s Palace, now Presidential Palace, at Krakowskie Przedmieście. One dreary morning, when the scaffolding which concealed that monument had been taken down and only the linen veilremained, the people of Warsaw gathered in crowds […]. Niemcewicz, the then chairman of the Association [of the Friends of Sciences], gave an inspiring speech and then made the sign for the veil to be removed. And in this very moment the sky, hitherto heavily overcast, brightened suddenly and a glittering ray fell straight onto the monument of Copernicus, which was just being revealed from under the veil. It seemed, therefore, that the sky itself desired to celebrate with us the memory of the great man who had once measured its paths; as if by bathing his statue in this bright light, it wished to convey to us that our thought and our toil were worthy of the blessing of divine Providence. The Copernicus monument was damaged in December 1944 and after the war underwent restoration. Since 1949 it has been positioned on the same spot that Thorvaldsen himself had selected for it over a hundred and twenty years before. A separate paper could be given on the topic of how those two monuments that constitute a part of the legacy of Thorvaldsen in Warsaw, became part of our city’s history. But a sobering final remark is this: Thorvaldsen still does not have a street of his name in Warsaw. It is perhaps the time to postulate this commemoration of the Danish sculptor, creator of not only these two monuments, but also of very many excellent portraits, including the beautiful likeness of Maria Szymanowska.